More options for reading online or print-on-demand can be found on the publications page. 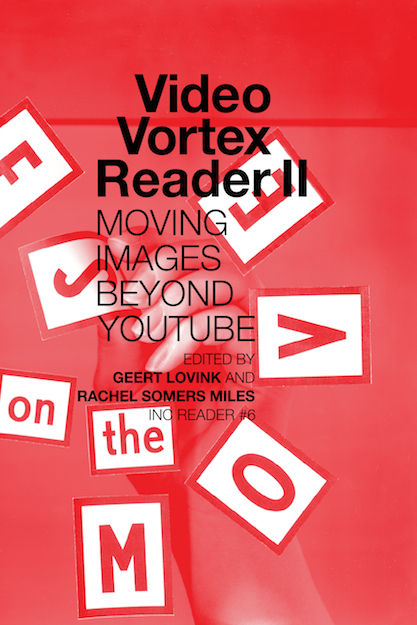 About the book: The Video Vortex Reader is the first collection of critical texts to deal with the rapidly emerging world of online video – from its explosive rise in 2005 with YouTube, to its future as a significant form of personal media. After years of talk about digital convergence and crossmedia platforms we now witness the merger of the Internet and television at a pace no-one predicted. These contributions from scholars, artists and curators evolved from the first two Video Vortex conferences in Brussels and Amsterdam in 2007 which focused on responses to YouTube, and address key issues around independent production and distribution of online video content. What does this new distribution platform mean for artists and activists? What are the alternatives? Contributors: Tilman Baumgärtel, Jean Burgess, Dominick Chen, Sarah Cook, Sean Cubitt, Stefaan Decostere, Thomas Elsaesser, David Garcia, Alexandra Juhasz, Nelli Kambouri and Pavlos Hatzopoulos, Minke Kampman, Seth Keen, Sarah Késenne, Marsha Kinder, Patricia Lange, Elizabeth Losh, Geert Lovink, Andrew Lowenthal, Lev Manovich, Adrian Miles, Matthew Mitchem, Sabine Niederer, Ana Peraica, Birgit Richard, Keith Sanborn, Florian Schneider, Tom Sherman, Jan Simons, Thomas Thiel, Vera Tollmann, Andreas Treske, Peter Westenberg. Colophon: Editors: Geert Lovink and Sabine Niederer. Editorial Assistance: Marije van Eck and Margreet Riphagen. Copy Editing: Darshana Jayemanne. Design: Katja van Stiphout. Printer: Veenman Drukkers, Rotterdam. Publisher: Institute of Network Cultures, Amsterdam. Supported by: Amsterdam University of Applied Sciences, School of Design and Communication, and XS4ALL. Geert Lovink and Sabine Niederer (eds. 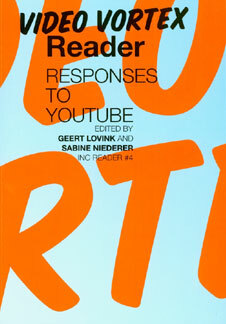 ), Video Vortex Reader: Responses to YouTube, Amsterdam: Institute of Network Cultures, 2008. ISBN: 978-90-78146-05-6.